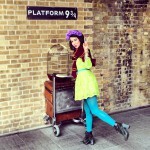 Polish fashion blogger Tamara Gonzales Perea is a very interesting person. 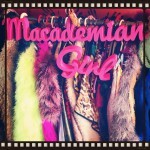 She is in love with color, fashion and journalism, and much of this she manages to put into her blog, that is called Macademian girl. In fashion world, Tamara’s style is perceived with rather controversial feedbacks: some like her extravagant looks, some consider her style too flamboyant and annoying – but she is definitely someone refreshing to look at, don’t you think? Tamara Gonzalez Perea: Interesting Or Annoying? You might ask what is so extraordinary about this girl. Well, it is how she chooses her outfits – that is a little bit unusual. Tamara is certainly a find for those who like extravagant fashion and bold color combinations. This 23-year-old fashion blogger writes for Polish ‘Glamour’ magazine apart from leading an interesting life that she records in her blog. 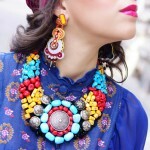 Her outfits are full of vibrant color combinations in classy elegant pieces. That’s what is so unusual in her. She can wear a baroque-inspired outfit in outrageous neon hues and look fantastic in it. Tamara is quite famous in fashion circles of Poland, as she has appeared in various TV talk shows, as well as given interviews for various magazines. Moreover she has worked in collaboration with such renowned brands as River Island, Diva, H&M, Adidas, Bourjois, Pandora, Shiseido and much more. Those who like her style note that she is reminding them of Anna Della Russo who is, by the way, actually her fashion icon. There is no color that is too bold for her. 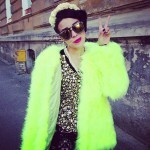 Neon green pumps with neon fake fur coat and pink dress in tribal print – why not? Metallic purple coat with mustard-colored tights – no big deal, she can handle anything. Despite the incredible bright colors she uses, she always looks spectacular and flawless. That is very inspirational, don you think? Well, which side are you on – the one who thinks her style is interesting, or annoying?